If you have ever tried to save photos or videos from Instagram or Vine, you might already know that there’s no direct option for it on either platforms. However, some third party apps and browser plugins can help you download photos and videos from these platforms. In this article, we’ll explore a few of them. Instagram was initially accessible only on mobile devices, but later on made it available for the web as well. You can download Instagram photos and videos on both web (Mac or PC) and mobile (Android, iOS) platforms. If you like tinkering with source code, this method will help you get the direct URL of the particular Instagram photo or video that you want to download. Once you get the URL, you can easily save the file using Chrome or by using any other third party download manager. Visit the post page by clicking on the time of post on your Instagram feed. Right click on the page and select “Inspect”. On the Inspect window, click on the Resources tab and navigate to “Frames/(www.instagram.com)/Images/“ on the left pane. Select the second image on the list. Now right click over the image on the right pane and choose “Copy image URL”. Open the copied URL in a new tab, right click on the photo and select “Save As” to save it. Right click on a blank area of the page and select “View Page Source”. Press Ctrl+F (on Windows) or Cmd+F (on Mac) to enable the Find function and search for “video_url” in the page source. You can get the video URL in the highlighted line as “video_url“: “<<video url here>>”. Copy the video URL. Open the copied URL in a separate browser tab, right click on the video frame and select “Save Video as”. The video will be saved to your computer. If you’re not much into code tinkering, there are a few Chrome extensions that can automatically grab Instagram photos and videos for you. One such extension is DInstagram. 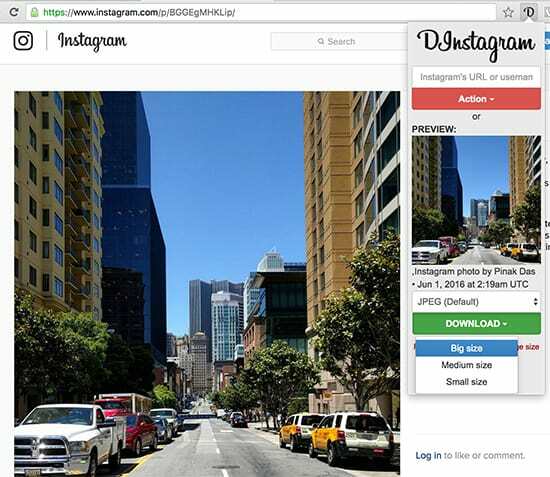 DInstagram automatically downloads photos and videos from any Instagram URL that is currently open in Chrome. On any Instagram webpage, clicking on the extension button opens up a menu where you can choose the photo or video that you want to download. Additionally, you can select the quality and format of the selected media, if multiple versions are available. Finally, clicking on the download button will save the Instagram photo or video to your computer. A large portion of Instagram’s user base accesses the platform via mobile apps. If you’re using an iPhone or any other iOS device, the following apps will help you directly grab Instagram photos to the Camera Roll. Repostly is a simple iOS app that lets you repost Instagram photos and videos directly with the Instagram app. The steps below will guide you to save Instagram photos and videos to your iPhone Camera Roll. Download and install Repostly from the App Store. Open Instagram app and choose “Copy Share URL” for the photo or video you want to save from Instagram. Now paste the URL into Repostly by tapping on “Tap to Paste URL” button. The app will automatically fetch the photo or video from Instagram. Tap on the “Repost to Instagram”. The app will prompt you to open Instagram, which you can cancel. The photo or video will be saved to the Camera Roll. Note: You don’t need to actually repost to Instagram in order to save a particular photo or video. Due to certain policy restrictions imposed by Instagram/Apple, most third party apps on the App Store can’t provide the feature to save photos or videos to the Camera Roll in a straight forward manner. The free version of the app includes a watermark of the owner’s username to the image or video while saving or reposting them. You can customize its position as well as the look and feel according to your preference. Additional features (such as watermark removal, Vine support, etc.) can be unlocked via in-app purchases. Some of the other apps that allow you to download Instagram photos and videos to iPhone, iPad Camera Roll include IG Saver, Repost, etc. If you’re using an Android device, there are similar apps that allow you to download photos and videos from Instagram. Below are a few of the popular ones. InstaSave is a free app that allows you to download your favorite Instagram photos and videos to your phone’s media gallery. Follow the steps below to save Instagram photos and videos using InstaSave on Android. Open Instagram app and choose “Copy Share URL” for the photo or video you want to save from Instagram. You may copy multiple photo or video URLs. Switch back to the InstaSave app and download the selected Instagram photos and videos. InstaSave automatically fetches the respective URLs from the clipboard and downloads them locally on your Android device. InstaSaver for Instagram is also a decent alternative app for downloading images, videos, text and hashtags from Instagram posts on Android devices. InstaSaver is available as a free download on Google Play Store. One of the easiest ways to save Instagram photos to your mobile device is to take a screenshot of it and then crop the picture accordingly. Even though the quality of the screenshot isn’t the same as that of the original, the difference might not be visible without an extensive inspection. It’s a quick, convenient way of grabbing those catchy Instagram photos that you come across abruptly on your photo browsing sessions. Before Instagram rolled out the video feature, it was Vine that made 6-second videos the new trend on the Internet. And many of the Vines you come across today are hilarious, amazing, share-worthy, and even save-worthy too. In this section, we’ll explore different options to download Vine videos. Similar to Instagram, you can find the direct URL of a Vine video by digging into its page source. Once you have the direct URL, you can download the Vine using a suitable download manager. The below steps will guide you to fetch the direct URL of a Vine video. Visit the post page by clicking on the time of post on your Vine feed. Press Ctrl+F (on Windows) or Cmd+F (on Mac) to enable the Find function and search for “video src” in the page source (without the quotes). You can get the video URL in the highlighted line as <video src=“<<video URL here>>?. Copy the video URL. Open the copied URL in a separate tab, right click on the video frame and choose “Save Video as”. The video will be saved to your computer. A Chrome Extension called Vine Downloader adds an additional option “Download Vine” in the right click menu of the web browser. Right click on any Vine video page and select the Download Vine option. The video should be downloaded to your computer. There are a few third party apps available on the App Store, which allow the user to download Vine videos to Camera Roll; though all of them are paid solutions. Video Downloader for Vine: This app helps you to download videos from Vine to your Camera Roll for offline viewing. It supports downloading of any Vine video that you can view. Just log into the app using your Vine credentials and browse through your feed. To save a video locally, browse any video on Vine and click on “Add to Downloads”. The video would be saved to your Camera Roll. Repostly, the iOS app that allows you to download Instagram photos and videos to Camera Roll, also has a premium feature that lets you save videos from Vine. If you’re an Android user, there are a number of free apps that allow users to download Vine videos. One such app is vDownloadr. vDownloader (for Vine): vDownloader is a simple, free app that allows you to do this conveniently. Just hit the Share button within Vine, adjacent to the particular video you want to share, and then choose “Share To…” from the Share menu. Choose vDownloadr from the list of supported sharing apps, and the particular Vine will be downloaded to your Android device. So, now that you know how to save Instagram photos, videos and Vines on your computer, iOS or Android device, you can save your favorite ones and keep them locally in your collection. If you know of any better alternative apps or workarounds to download media content from Instagram or Vine, let us know about them in the comments below. 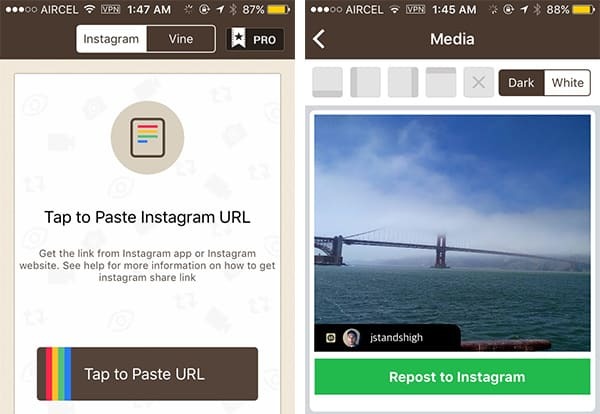 Disclaimer: Users should not download content from Instagram or Vine without the permission of the respective owners. 7labs may not be held responsible for the misuse of any of the information provided in this article.